Last year Natick, Massachusetts experienced another year of gains in the residential real estate market. The number of homes sold dropped as inventory reached a low, but this further drove up real estate values. 2014 marks the third consecutive year of single family home price increases in the city. Enticed by the still low interest rates, buyers continued the momentum built in 2012 and 2013, and came out in force despite the lower number of homes on the market. This resulted in numerous multiple offers, quick sales, and increases in prices. Sale inventory remains extremely low, so the seller's market is continuing in Natick. 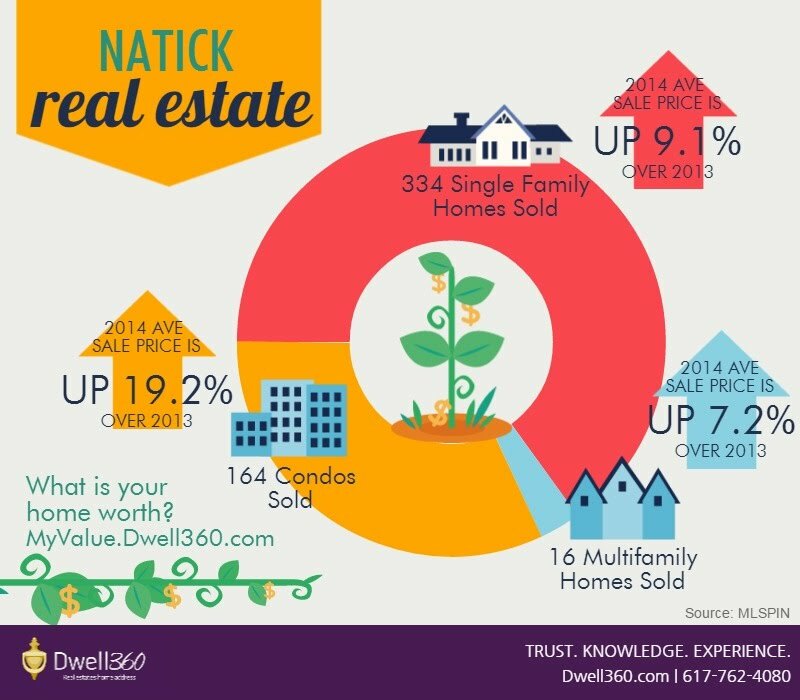 Natick’s single family homes produced the highest average sales price in the last ten years. The average price is up another 9.1%, from $525,777 in 2013 to $574,125 in 2014. While the number of homes sold decreased from 368 in 2013 to 334 in 2014, the time they spent on the market decreased again to only 50 days on average. Condominium prices are up a staggering 19.2% to an average of $368,598. Once an affordable way into the Natick market, condos and townhouses are being snapped up after spending only 51 days on the market. In 2014 multifamily homes were also in high demand, causing prices to increase by 7.2% to an average of $470,525. The number of homes sold was only 16, and they spent 74 days on the market. Now is a great time to sell your multifamily home as inventory remains low in Natick. Market Data Source: MLSPIN, as of 1/29/2015.